One of the benefits of cleaning your house out is that you need to use up what’s left in the fridge/freezer/cupboards, or, at least, the perishables. So, following my batch of Raspberry Spiked Chocolate Brownies, I had some raspberries left over. I also discovered that I had a whole bag of really manky, heat-effected white chocolate chips. Unfortunately, as I discovered, manky white chocolate doesn’t recover its tastiness quite as well as manky dark or milk chocolate when baked so it came out kind of chalky. It still tasted okay, but I recommend using new choc chips! I used a basic recipe for Whatever Biscuits that I remember by calling it “half, half, one, one, one”. Which is actually totally inaccurate, it’s just a way of remembering it, same as I remember how to make pavlova (4-1-1-1, which, conversely, actually IS completely accurate). I turned one of the “one”s into “slightly bigger than a half, x2” and added some vanilla, which I guess could be another “one” because it was probably about one teaspoon, but may also be a “half” because I guess I didn’t put that much into it, so maybe it was half a teaspoon? Of course, the first half isn’t actually a half, either – it’s slightly less than a half. And if you’re American, I’m pretty sure you’d call it “One, half, one, one, one” because that first half is a little less than half an Australian block of butter, which I **think** equates to about one American “stick”. But I’m not American. I’m also rambling. I think what I’m trying to say is that it’s a fairly flexible recipe, and that if you’re Rain Man enough you can find a pattern in anything! 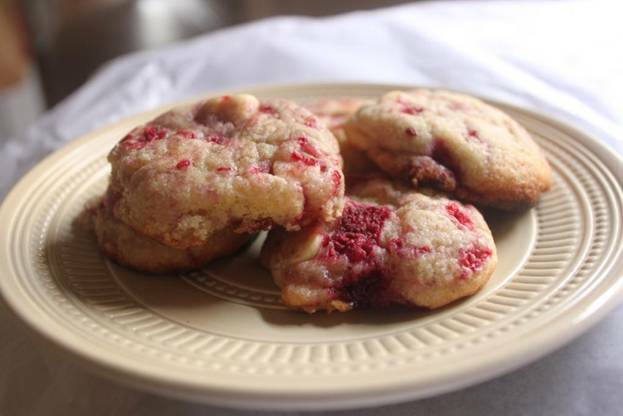 Now, I found these to be a little on the soft side – not at all a crunchy biscuit – so it you’re feeling especially coordinated you could maybe add a little more flour to compensate for the juiciness of the berries (and the ice crystals stuck to them – so maybe the trick is NOT to use old frozen raspberries!). I am aware it’s common to dust berries with flour prior to adding them to cake batters to stop them sinking so much, so maybe that’s the sort of quantity of flour we’re talking about here. In the end, the following morning (before I brought them to someone’s house for morning tea – I am incapable of not fiddling with food if I don’t think it’s quite right and someone else will eat it), I whacked them in the oven for about another 6-8 minutes at about 180oC (and at some point I turned it up higher, because we know what an impatient and imprecise cook I am). I watched them VERY closely this time to make sure they didn’t catch. They seemed to brown on top more than the bottom this time around. I guess some of the moisture had evaporated from them overnight or something. Do you like the plate, by the way? I had a sudden stroke of genius the other day when I saw this on sale. I realised how hard it is to take photos of biscuits on glossy white plates, and also kind of boring, so I found a few of different colours and patterns in various bargain bins. This one set me back – wait for it – a dollar. And from a really expensive store that sells only Waterford and Villeroy & Boch and Royal Albert the like, too. Bargain! Don’t ask me what brand it is, though. Don’t get me wrong, white plates look great with some foods. Anything involving Bok Choy looks spectacular on a white plate – I think it’s the crisp white and the crisp green that does it. Biscuits? Not so much. Not to me, anyhow. If the white background has you puzzled, it’s a piece of tissue paper (from the purchase of this plate) draped over my clotheshorse near the only window that gets good natural light. There were some better photos of the biscuits, but that was before I added the tissue paper, so the plate is basically sitting on top of towels, underwear and socks that were drying, and I didn’t think you really needed to see that when you’re supposed to be focussing on the biscuits! Also, about a week earlier I made a variation of these but with dark chocolate and pecans, both chopped. I ate them before I remembered I was supposed to take a photo of them. And some of them were GIGANTIC biscuits (but not quite as gigantic as the ones me and my BFF Alice used to make as teenagers. Or as phallic. Giggle. Yep, we used to make phallic choc-chip biscuits, and also giant ones, and then we’d eat them with giant glasses of milk. It was one of the many things that cemented our friendship J Hi, Alice! *waves* Um, sorry if you didn’t want the entire universe to know about that!). Anyway, where was I? Oh yeah, those dark choc and pecan ones were soooo gigantic and soooo tasty... *has a sudden epiphany as to why I gained weight last week* Oh, and I didn’t mention in the above recipe that I was using unsalted butter because it’s all I had left, and added salt to compensate, so I don’t know whether you may want to add some salt to your mix. Up to you. Do what feels right. Same went for the dark chocolate/pecan combination, which I suspect could probably benefit from a pinch of salt. Damnit, now I want biscuits! These biscuits look great! 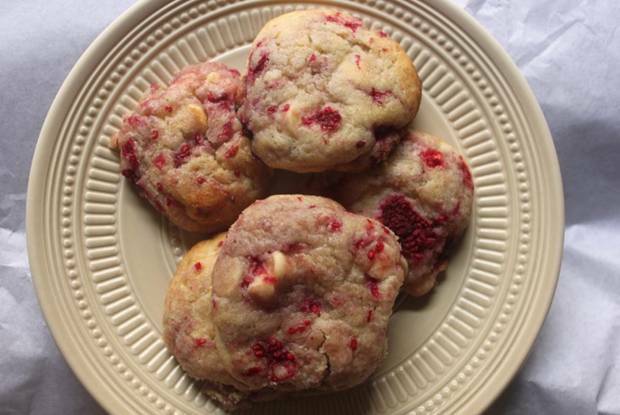 Love the idea of turning something usually savory like a biscuit into something sweet! And that plate is an awesome bargain! Great job scoring that! Thanks Jenni :) Your comment confused me for a second, until I remembered that what you call biscuits are what we call scones, and what we call biscuits you call cookies! I also think that your "biscuits" are more dense than our "scones" if I'm not much mistaken, and more functional - we serve ours with jam and cream for morning or afternoon tea, and making a light and fluffy scone rather than a dense, filling one is considered to be quite an achievement. You seem to serve yours as a more filling snack or as part of a meal. If you scroll down on this post http://theteensytinyinsignificantdetails.blogspot.com/2010/02/tale-of-two-friands.html you'll find a variation on a recipe for what we call scones (generally they are made with butter and flour not cream and flour, but I find the cream makes them lighter and is way easier to mix). It's pretty common to find scones with sultanas or raisins in them here, and I reckon I've seen them with raspberry and white chocolate, too. I wish I'd remembered that and made them instead of the biscuits!